This Missile is the standart Radar missile for the MiG-29. It is a fairly large missile with a semi active radar seaker head. It´s warhead contains 39 kg of high explosives. To guide the missile to the target, the radar of the shooter sends target information to the missile in flight and steers it into the right direction. In the end game the passive seaker is looking for the radar reflections of the target and takes collision course. Therefor it is necessary to illuminate the target until impact. This is the infrared version of the R-27. The missile gets all rlevant target data just prior launch and then steers towards it. It is looking for infrared energy radiated by the target aircraft (exhaust) and once accquired it homes onto. A fairly small infrared missile for close range. It can be slewed onto the target with the melmet mounted sight system and then steers towards the target, it is a "fire and forget" missile. This extremly maneuverable IR missile is a real dogfight weapon. It also can be slewed with the pilot´s helmet mounted sight upto 45-60 degrees off boresight. It uses a vectored thrust system to make very tight turns and even score against hard defending targets. 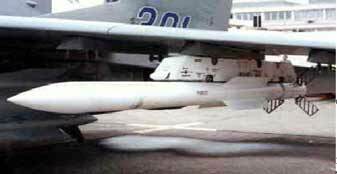 This missile in combination with the agility of the MiG-29 airframe was (and still is) the most leathal weapon system in close visual combat! This modern air to air missile will be the future standart on russian fighters. Alike the R-27 it is guided to a certain point with the help of a data link. But then it uses an onboard active radar to illuminate the target and steers towards it. As with the western AIM-120 AMRAAM it gives the pilot a certain "fire and forget" capability. Medium size missile with strang looking airfoils at the end. Besides the russian forces the R-77 has been delivered to Malaysia and Peru. Also India got some for their Su-30. Like the R-77 but with a different Rocket motor and more weight. It is still under developement and is expected to be in service not earlier than 2007. According to official sources it will have a 50-60 % larger launch range. The MiG-29 has a internal gun in the left wing root. It is a fixed single barrel gun of caliber 30mm and has a total ammunition amount of 150 rounds. The cadence of the gun is 1500 - 1800 rpm. The gun can be used against air or ground targets upto 2000m range.